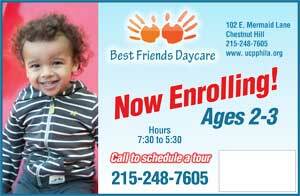 Best Friends Daycare provides a curriculum that promotes the development of confident children who are problem solvers and life-long learners. We use the Creative Curriculum as our model of learning and assessment. We create opportunities and experiences that tap into the natural curiosity of each child and their desire to learn. 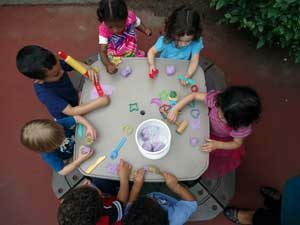 Activities such as sand and water play, block building, cooking, drawing, painting, reading, and creative dramatics provide experiences rich in developmental potential. Contact us to schedule a tour. Our program is inclusive, meaning that children with and without disabilities are served in the same classroom environment. Inclusion embraces the philosophy that children with special needs can learn best and develop to their fullest potential when educated with peers who are typically developing. We also believe that children who are typically developing can learn and grow to their maximum potential, when they are exposed to children of varying abilities. Provided with the proper supports and interventions, the experiences for both children with “typical” needs and children with special needs are rewarding, and contribute to the development of nurturing, caring, confident, curious children.